In this week’s episode of Mad Genius Tips, F&W’s Justin Chapple reveals how to make sweet-and-savory bacon cinnamon rolls in a flash. The fluffy, gooey pastries are incredible additions to any brunch—primarily because they give everyone the opportunity to eat even more bacon. Here, more surprising ways to sneak bacon into brunch dishes. 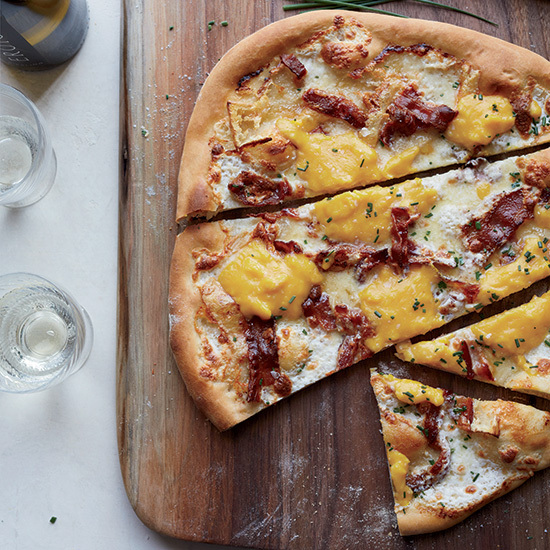 This over-the-top breakfast pizza features crisp bacon, custardy scrambled eggs and two cheeses—Brie and mozzarella. Crispy, sweet and salty candied bacon is an incredible garnish for a Bloody Mary. Fold crispy bacon crumbles into pumpkin pancakes and top with maple syrup. It’s the perfect mix of sweet and savory. Andrew Zimmern makes his tortillas with bacon fat for extra flavor. Use them to make the best-ever breakfast tacos. Chef Hugh Acheson studs flaky biscuits with chopped bacon and scallions. Congee, a comforting rice porridge, is delicious mixed with crispy bacon and sautéed onions. Transform kale Caesar salad into a terrific brunch dish by adding bacon and hard-boiled eggs.